Location: 2914 S. Third St.
Daily — Tue, Thurs: 9:30 a.m.
Holy Name began as a faith community of twenty Catholic families, most of whom gained their livelihood as Louisville and Nashville Railroad workers. The first Mass was celebrated in the rectory on March 1, 1891. By May, a beautiful, frame Gothic church was completed. The parish grew so rapidly that within two years Father John T. O’Connor, the first pastor, had to build an addition, doubling the seating from 160 to 320. With the transfer of the freight terminal of the Louisville and Nashville Railroad to South Louisville, the parish surged in membership. By 1902, a combination church-school building was constructed. As the school grew, plans developed to build a permanent church structure; completed in 1912, it remains today. 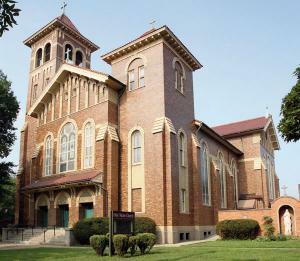 From then on, the parish developed, among other things, a parochial mega-school, a musical establishment consisting of the Holy Name Band and choral clubs, the city-wide Corpus Christi observance, an influential Holy Name Society, a powerful St. Vincent de Paul ministry, and the “backside,” or barn-area ministry at Churchill Downs. The parish gave birth to Most Blessed Sacrament (1937), Our Mother of Sorrows (1937), St. Thomas More (1944), SS. Simon and Jude (1950), St. John Vianney (1951), and St. Jerome (1953). The school was staffed by the Sisters of Charity of Nazareth until it closed in 1992 because of a declining Catholic population. The Sisters of Charity remain involved in the outreach efforts of the parish. Parish outreach efforts include ministry to the growing Hispanic population around Churchill Downs and a parish visitor program. Holy Name is the parish church for the University of Louisville. Its large plant houses the offices of Catholic Charities. Today, with about 550 parishioners, the intense efforts of earlier parishioners to build a parish are still bearing fruit.